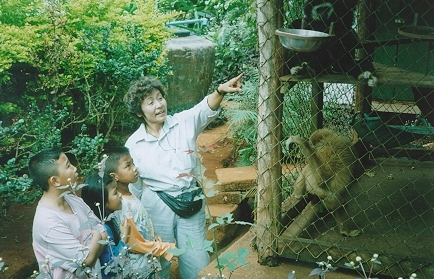 Highland Farm provides personal educational tours of the Gibbon Sanctuary. Since 1991, there have been approximately 12,000 visitors. The visitors have a rare opportunity to observe first-hand the wondrous gibbons and hear about their individual survival stories. 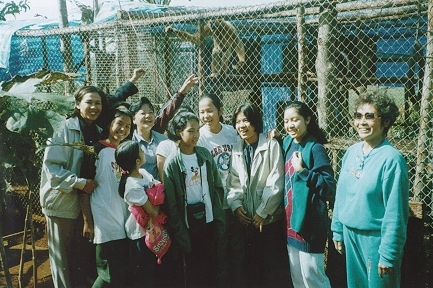 It is not unusual for foreign and Thai visitors to realize the problems facing Thailands wild gibbons, how few are left and the reasons contributing to their decline. As their forest homes diminish, these animals continue to be exploited by being removed as babies from their natural habitat for entertainment, pets, and medical experiments. It is hoped through education and public awareness that the profit will be removed from the heads of these precious animals. 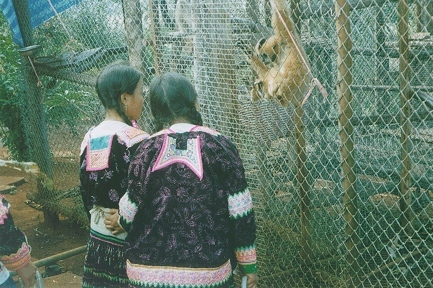 Living options for captive gibbons that survive are limited, sanctuaries and refuge centers being their adopted homes. Our Gibbon Sanctuary is a world between jungle and zoo that is not only a safe haven for captive gibbons but helps to educate the people who visit. 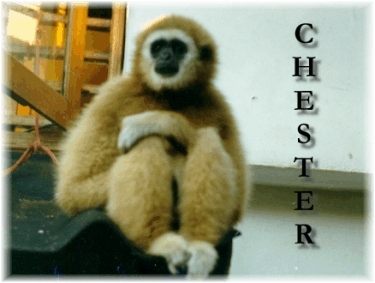 It is the gibbons great agility and responsive behavior that make us appreciate their classification as primates in the animal kingdom. Their unique communication is as individual as their personalities. It is no wonder that almost every Highland Farm visitor leaves with a deeper appreciation of their intelligence, beauty, and need to be protected so they may survive and thrive in the forests. 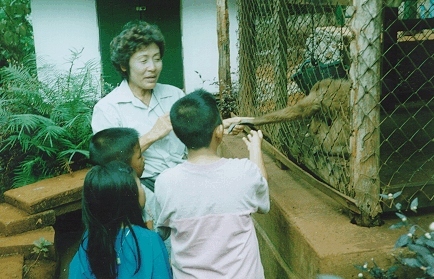 Highland Farm supports worldwide conservation programs, gibbon primate research (non-invasive), school education programs, and the global adopt-a-gibbon project. We are optimistic that our efforts along with similar work from other concerned individuals and agencies will make a difference. We continuously grow and learn to improve our gibbon community. Highland Farm is indebted to Chester for touching our lives ten years ago and by showing us the way to give back for the greater good.